This book focuses on the bilateral and multilateral relations between Britain, the 'former proprietor' and Israel, the 'successor state', during the period following their armed clash in January 1949, to Israel's withdrawal from the Gaza and the Sinai in March 1957. 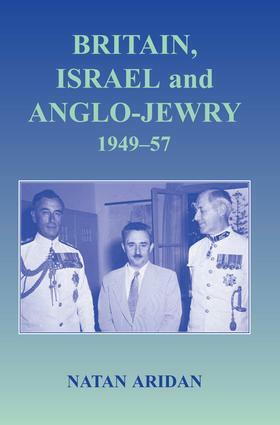 It highlights the formulation of foreign policy decisions in Britain and Israel; Britain's special responsibility and influence, which affected Israel's relations with neighbouring Arab states; Israel's complex policy towards Britain; Anglo-Jewry's attitude towards Israel and the distinctive relationship between Israel's embassy in London and the Jewish community. Natan Aridan is a researcher at the Ben-Gurion Research Center at Sede-Boker and lectures on Israeli diplomacy and Israel's relations with the Diaspora at the History Department of Ben-Gurion University of the Negev.